"AEW" redirects here. For other uses, see AEW (disambiguation). An airborne early warning and control (AEW&C) system is an airborne radar picket system designed to detect aircraft, ships and vehicles at long ranges and perform command and control of the battlespace in an air engagement by directing fighter and attack aircraft strikes. AEW&C units are also used to carry out surveillance, including over ground targets and frequently perform C2BM (command and control, battle management) functions similar to an Air Traffic Controller given military command over other forces. When used at altitude, the radar on the aircraft allows the operators to detect and track targets and distinguish between friendly and hostile aircraft much farther away than a similar ground based radar. Like a ground based radar, it can be detected by opposing forces, but because of its mobility, it is much less vulnerable to counter-attack. AEW&C aircraft are used for both defensive and offensive air operations, and are to the NATO and US forces trained or integrated Air Forces what the Command Information Center is to a US Navy warship, plus a highly mobile and powerful radar platform. The system is used offensively to direct fighters to their target locations, and defensively, directing counterattacks on enemy forces, both air and ground. 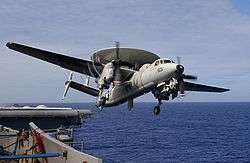 So useful is the advantage of command and control from a high altitude, the United States Navy operates Northrop Grumman E-2 Hawkeye AEW&C aircraft off its Supercarriers to augment and protect its carrier Command Information Centers (CICs). The designation "airborne early warning" (AEW) was used for earlier similar aircraft, such as the Fairey Gannet AEW.3 and Lockheed EC-121 Warning Star, and continues to be used by the RAF for its Sentry AEW1, while AEW&C (airborne early warning and control) emphasizes the command and control capabilities that may not be present on smaller or simpler radar picket aircraft. AWACS (Airborne Warning And Control System) is the name of the specific system installed in the E-3 and Japanese Boeing E-767 AEW&C airframes, but is often used as a general synonym for AEW&C. Modern AEW&C systems can detect aircraft from up to 400 km (220 nmi) away, well out of range of most surface-to-air missiles. One AEW&C aircraft flying at 9,000 m (30,000 ft) can cover an area of 312,000 km2 (120,000 sq mi). Three such aircraft in overlapping orbits can cover the whole of Central Europe. AEW&C systems communicate with friendly aircraft, vectoring fighters towards bogeys, providing data on threats and targets, help extend their sensor range and make offensive aircraft more difficult to track, since they no longer need to keep their own radar active to detect threats. After having developed the first ground based early-warning radar detection system, Chain Home, the British developed a radar set that could be carried on an aircraft for what they termed "Air Controlled Interception". The intention was to cover the North West approaches where German long range Focke-Wulf Fw 200 Condor aircraft were threatening shipping. A Vickers Wellington bomber (serial R1629) was fitted with a rotating antenna array. It was tested for use against aerial targets and then for possible use against German E boats. Another radar equipped Wellington with a different installation was used to direct Bristol Beaufighters toward Heinkel He 111s, which were air-launching V-1 flying bombs. In February 1944 the U.S. Navy ordered the development of a radar system that could be carried aloft in an aircraft under Project Cadillac. A prototype system was built and flown in August on a modified TBM Avenger torpedo bomber. Tests proved successful, with the system being able to detect low flying formations at a range in excess of 100 miles (160 km). The U.S. Navy then ordered production of the TBM-3W, the first production AEW aircraft to enter service. TBM-3Ws fitted with the AN/APS-20 radar entered service in March 1945, with some 36–40 eventually being constructed. The Lockheed WV and EC-121 Warning Star, which first flew in 1949 served widely with both the US Air Force and US Navy and provided the main AEW coverage for US forces during the Vietnam war. It was to remain operational until replaced with the E-3 AWACS, its intended successor. 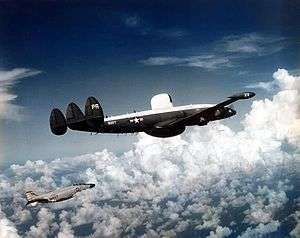 Developed roughly in parallel, N-class blimps were also used as AEW aircraft, filling in gaps in radar coverage for the continental US, their tremendous endurance of over 200 hours being a major asset in an AEW aircraft, although lighter than air operations were discontinued in 1962 following a crash. In 1958, the Soviet Tupolev Design Bureau was also ordered to design an AEW aircraft. After determining that the projected radar instrumentation wouldn't fit in a Tupolev Tu-95 or a Tupolev Tu-116, the decision was made to use the more capacious Tupolev Tu-114 instead. This solved the problems with cooling and operator space that existed with the narrower Tu-95 and Tu-116 fuselage. To meet the flight range requirements, production examples were fitted with an air-to-air refueling probe. The resulting system, the Tupolev Tu-126, entered service in 1965 with the Soviet Air Forces and remained in service until replaced by the Beriev A-50 in 1984. Many countries have developed their own AEW&C systems, although the Boeing E-3 Sentry and Northrop Grumman E-2 Hawkeye are the most common systems worldwide. The E-3 Sentry was built by the Boeing Defense and Space Group (now Boeing Defense, Space & Security) and was based on the Boeing 707-320 aircraft. 65 E-3 were built and it is operated by the United States Air Force, NATO, the British Royal Air Force, France and controversially, Saudi Arabia. The specially designed Grumman E-2 Hawkeye entered service in 1965 and has been operated by eight different nations. Over 168 have been produced so far and new versions continue to be developed making it the most widely used AEW system. For the Japan Air Self-Defense Force, the E-3 technology has been fitted into the Boeing E-767. After World War 2, the United Kingdom deployed a substantial AEW capability with American Douglas AD-4W Skyraiders, designated Skyraider AEW.1, which in turn were replaced by the Fairey Gannet AEW.3, using the same AN/APS-20 radar. With the retirement of the conventional aircraft carriers, the Gannet was withdrawn and the Royal Air Force (RAF) installed the radars from the Gannets on Avro Shackleton MR.2 airframes, redesignated Shackleton AEW.2. To replace the Shackleton AEW.2, an AEW variant of the Hawker Siddeley Nimrod, known as the Nimrod AEW3, was ordered in 1974. However, after a protracted and problematic development, this was cancelled in 1986, and seven E-3Ds, designated Sentry AEW.1 in RAF service, were purchased instead. The Russian Air Force is currently using around 15–20 Beriev A-50 and A-50U "Shmel" in the AEW role. The "Mainstay" is based on the Ilyushin Il-76 airframe, with a large non-rotating disk radome on the rear fuselage. These replaced the 12 Tupolev Tu-126 that filled the role previously. The A-50 and A-50U will eventually be replaced by the Beriev A-100, which features an AESA array in the radome and is based on the updated Il-476. In May 1997 Russia and Israel agreed to fulfill jointly an order from China to develop and deliver an early warning system. China reportedly ordered one Phalcon for $250 million, which entailed retrofitting a Russian-made Ilyushin-76 cargo plane [also incorrectly reported as a Beriev A-50 Mainstay] with advanced Elta electronic, computer, radar and communications systems. 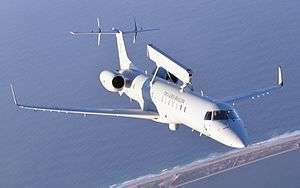 Beijing was expected to acquire several PHALCON AEW systems, and reportedly could buy at least three more [and possibly up to eight] of these systems, the prototype of which was planned for testing beginning in 2000. Finally, in July 2000 the United States pressured Israel to back out of the $1 billion agreement to sell China four Phalcon phased-array radar systems. Following the cancelled A-50I/Phalcon deal, China turned to indigenous solutions. 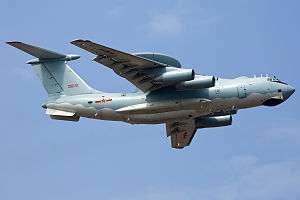 The Phalcon radar and other electronic systems were taken off from the unfinished Il-76, and the airframe was handed to China via Russia in 2002. The Chinese AWACS has a unique phased array radar (PAR) carried in a round radome. Unlike the US AWACS aircraft, which rotate their rotodomes to give a 360 degree coverage, the radar antenna of the Chinese AWACS does not rotate. Instead, three PAR antenna modules are placed in a triangular configuration inside the round radome to provide a 360 degree coverage. The installation of equipment at the IL-76 began in late 2002 aircraft by Xian aircraft industries (Xian Aircraft Industry Co.). The first flight of an airplane KJ-2000 made in November 2003. All four machines will be equipped with this type. The last to be introduced into service the Chinese AIR FORCE until the end of 2007. In 2003, the Indian Air Force (IAF) and Defence Research and Development Organisation (DRDO) began a study of requirements for developing an Airborne Early Warning and Control (AEWAC) system. The Indian Air Force operates three IsraelEL/W-2090 systems (Il-76/Phalcon system deal canceled for China), the first of which first arrived on May 25, 2009. The air force is also testing the DRDO AEW&CS. India subsequently signed with Israel to pick up the A-50I instead of China, therefore, A50I adopted the 3-radar arrangement designed by Chinese team. The Royal Australian Air Force, Republic of Korea Air Force and the Turkish Air Force are deploying Boeing 737 AEW&C aircraft. Unlike the E-2 and E-3, the Boeing 737 AEW&C does not use a rotating disk radome (rotodome) but instead has a large dorsal fin. The Swedish Air Force uses the S 100B Argus as its AEW platform. The S 100B Argus is based on the Saab 340 with an Ericsson Erieye PS-890 radar. The Hellenic Air Force, Brazilian Air Force and Mexican Air Force use the Embraer R-99 with an Ericsson Erieye PS-890 radar, as on the S 100B. In early 2006, the Pakistan Air Force ordered six Erieye AEW equipped Saab 2000 from Sweden. In December 2006, the Pakistan Navy requested three excess P-3 Orion aircraft to be equipped with Hawkeye 2000 AEW systems. China and Pakistan also signed a memorandum of understanding (MoU) for the joint development of AEW&C systems. Israel has developed the IAI/Elta EL/M-2075 Phalcon system, which uses an AESA (active electronically scanned array) in lieu of a rotodome antenna. The system was the first such system to enter service. The original Phalcon was mounted on a Boeing 707  and developed for the Israeli Defense Force and for export. 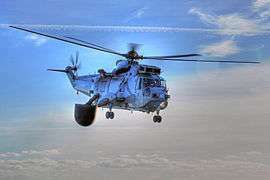 The British Sea King ASaC7 naval helicopter was operated from Invincible-class aircraft carriers. The creation of Sea King ASaC7, and earlier AEW.2 and AEW.5 was the consequence of lessons learnt by the Royal Navy during the 1982 Falklands War when the lack of AEW coverage for the task force was a major tactical handicap, and left them vulnerable to low level attack. The Spanish Navy fields the SH-3 Sea King in the same role, operated from the LPH Juan Carlos I. The AgustaWestland EH-101A AEW of the Italian Navy is operated from the aircraft carriers Cavour and Garibaldi. In 2018 the British will replace their Sea Kings with a modular "Crowsnest" system that can be fitted to any of their Merlin HM2 fleet. The Russian-built Kamov Ka-31 is deployed by the Indian Navy on the aircraft carrier INS Vikramaditya and Talwar-class frigates and will be deployed on the Vikrant-class aircraft carriers. The Russian Navy has two Ka-31R variants, at least one of which was deployed on their aircraft carrier Kuznetsov in 2016. It is fitted with E-801M Oko (Eye) airborne electronic warfare radar that can track 20 targets simultaneously, detecting aircraft up to 150 km (90 mi) away, and surface warships up to 200 km (120 mi) distant. Boeing produces a specific system with a rotating radar dome 'rotodome' radome designed and built by Boeing (Defense & Space Group) using Westinghouse (now Northrop Grumman) radar. It is mounted on either the E-3 Sentry aircraft (Boeing 707) or more recently the Boeing E-767 (Boeing 767), the latter only being used by the Japan Air Self-Defense Force. When AWACS first entered service it represented a major advance in capability, being the first AEW to use a pulse-Doppler radar, which allowed it to track targets normally lost in ground clutter. Previously low-flying aircraft could only be readily tracked over water. 1 2 "AWACS to Bridge the Technological Gap". Air University. Retrieved 14 February 2009. ↑ "AWACS: Nato's eyes in the sky" (PDF). Nato. ↑ Flypast April 1987: "The First AWACS"
↑ "BAe Nimrod AEW 3." Spyflight. Retrieved: 21 October 2010. ↑ Butowski, Piotr. "Model Reveals A-100 Configuration". Air International, April 2014. Retrieved: 21 July 2014. ↑ "Kongjing-2000 (KJ-2000) Mainring". GlobalSecurity.org. Retrieved 1 April 2015. ↑ "Development of Airborne Early Warning and Control System" (Press release). Press Information Bureau, GoI. 11 December 2003. Retrieved 2008-07-25. ↑ "Arms deal underway, first Israeli Phalcon lands in India – Israel News, Ynetnews". Ynetnews.com. June 20, 1995. Archived from the original on 28 May 2009. Retrieved June 1, 2009. ↑ "India set to decide big military aircraft deals". India Strategic. Retrieved 3 January 2014. ↑ "Ausairpower". Ausairpower.net. Retrieved 14 April 2015. ↑ 07-Apr-2008 11:12 EDT (April 7, 2008). "Sweden Finalizes Saab 2000 AEW&C Contract With Pakistan". Defenseindustrydaily.com. Retrieved June 1, 2009. ↑ "C4ISRJournal.com". C4ISRJournal.com. December 11, 2006. Archived from the original on July 8, 2011. Retrieved June 1, 2009. 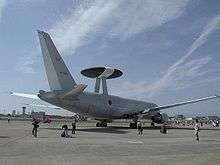 ↑ "$278m AWACS deal struck with China: PAF » www.idrw.org / Indian Defense Research Wing". Idrw.org. Retrieved June 1, 2009. ↑ "B707 Phalcon, "Israeli Weapons.com"". Israeli-weapons.com. Retrieved 2012-03-31. ↑ Hoyle, Craig (22 May 2015). "Thales bags selection for RN Crowsnest system". Flight Global. ↑ "Ka-31 Radar Picket Airborne Early Warning (AEW) Helicopter, Russia". Airforce-technology. Retrieved 3 January 2014. Davies, Ed. "AWACS Origins: Brassboard – Quest for the E-3 Radar". Air Enthusiast. No. 119, September/October 2005. Stamford, Lincs, UK: Key Publishing. pp. 2–6. ISSN 0143-5450. Gibson, Chris (2011). The Admiralty and AEW: Royal Navy Airborne Early Warning Projects. Blue Envoy Press. ISBN 978-0956195128. Gordon, Yefim; Komissarov, Dmitriy (2010). Soviet/Russian AWACS Aircraft: Tu-126, A-50, An-71, Ka-31. Red Star Vol. 23. Hinckley, England: Midland Publishing. ISBN 978-1857802153. Gordon, Yefim; Davison, Peter (2006). Tupolev Tu-95 Bear. Warbird Tech. 43. North Branch, Minnesota: Specialty Press. ISBN 978-1-58007-102-4. Hurturk, Kivanc N (1998). History of the Boeing 707. Buchair UK. ISBN 0-9666368-0-5. Lake, Jon. "Aircraft of the RAF – Part 10 Sentry AEW.1". Air International. No. Vol 76 No. 2, February 2009. Stamford, UK: Key Publishing. pp. 44–47. Lloyd, Alwyn T. (1987). Boeing 707 & AWACS. in Detail and Scale. Falbrook, CA: Aero Publishers. ISBN 0-8306-8533-2. Pither, Tony (1998). The Boeing 707 720 and C-135. Air-Britain (Historians). ISBN 0-85130-236-X. Wilson, Stewart (1998). Boeing 707, Douglas DC-8, and Vickers VC-10. Fyshwick, Australia: Aerospace Publications. ISBN 1-875671-36-6. Wikimedia Commons has media related to Early Warning Aircraft (AEW/AWACS).